The trail is a way to promote customers visiting independent dairy farms and the creameries through where they sell milk and ice cream products. The three county creameries on the trail are Fox Meadows Creamery, 2475 W. Main St., Ephrata; Lapp Valley Farm, 244 Mentzer Road, New Holland; and The Milkhouse at Oregon Dairy, 2900 Oregon Pike, between Neffsville and Brownstown. The “farm-to-cone” ice cream trail was launched by state officials Thursday morning at Fox Meadows. Those who want to sample their way through these creameries can download a Pursue Your Scoops ice cream passport online. Those who get their passport stamped at six of the creameries can get a Pursue Your Scoops T-shirt. Those who visit all 12 can get an ice cream scoop. The other creameries on the trail are Coventry Parlor at Laurel Locks, Pottstown; Patches Family Creamery, Lebanon; Perrydell Farm Dairy, York; Twilight Acres, Womelsdorf; Chester Springs Creamery at Milky Way Farm, Chester Springs; Crystal Spring Farm, Scnecksville; Freddy Hill Farm and Merrymead Farm, Lansdale; and Way-Har Farms, Bernville. To claim prizes, those traveling the trail should send their completed passports by Oct. 31 of this year to the Center for Dairy Excellence, 2301 N. Cameron St., Harrisburg, PA 17110. Visit the ice cream trail’s website for more information. The trail is sponsored by the agriculture department, the Center for Dairy Excellence and the Commonwealth of Pennsylvania’s tourism website, VisitPA.com. 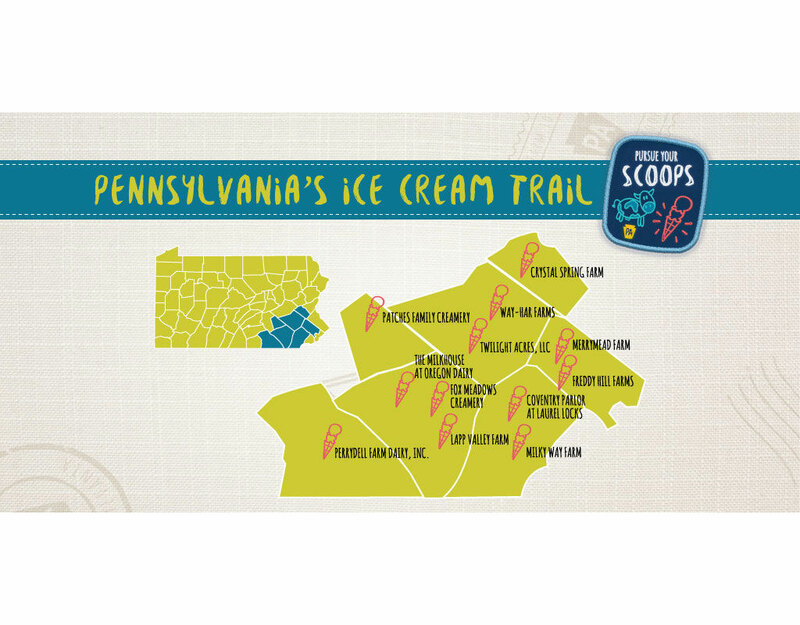 The three organizations are encouraging those visiting the creameries on the trail to share their photos and experiences on social media, using the hashtag #PursueYourScoops, for more chances at prizes.